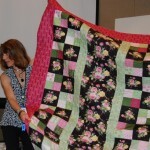 QuiltWoman.com hosted 5 schoolhouses this past weekend at market. Here are a few pictures from just a sampling of our schoolhouses. Pictured above is Ann Dudek, promoting her book Scrapbook Calendar Quilt and the lovely Peg Stone helping her hold the large quilt. 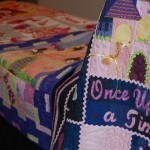 Peg also hosted her own schoolhouse for QuiltWoman.com titled Deceptively Simple. 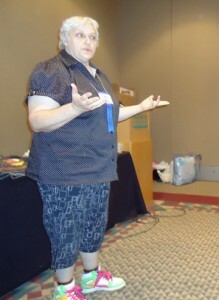 Also in the mix is Blank Quilting fabric rep and QuiltWoman.com pattern rep, Dolores Joshua. She gave an outstanding presentation on “Maximizing Profits with Minimal Investment”. 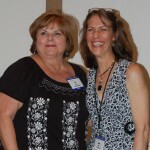 Ro and Lacey’s schoolhouse presentation promoted their Easy Sew series of books, which focus on building a whole coordinated room around a simple quilt pattern and amazing fabrics. The fabrics in their books were actually designed by Ro Gregg for Northcott. Another schoolhouse, the last of the day, was given by Beth Helfter. 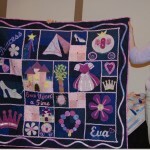 She featured her first book, Once Upon A Time: Fairytale Puzzle Quilts. The schoolhouse series is a great way for shops and guest to really learn what the creator of any project, pattern, fabric line, or notion really envisions for their item and it’s a great way to get tips on selling the item in your shop. Along with all the information, most schoolhouse presentations end up being a mini-trunk show, like Beth’s collection of quilts from her book. We hope you made it out to the schoolhouse series. Ladies, you did a wonderful job!